Reliable help in healing deep and hard-to-reach wounds. and significantly reduces the treatment time. 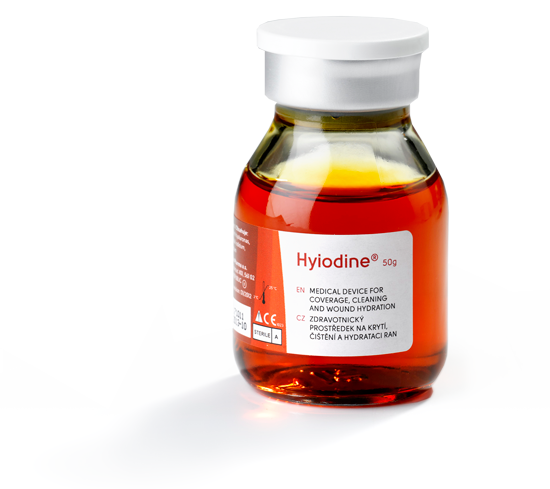 Hyiodine is a medical device creating ideal conditions for the successful healing of any wound. The high quantity of hyaluronic acid effectively boosts the natural regeneration of damaged tissues. The iodine complex cleans the wound and protects it from infection. Because it is in gel form, Hyiodine can be applied to very deep and hard-to-reach wounds. It is highly effective in healing fistulae, undermined wounds and pockets. The healing gel simply flows wherever it is needed. The natural composition of Hyiodine is behind its maximum safety and high efficacy. As a result, Hyiodine can be used for deepest wounds with exposed bone structures, tendons or joint capsules. 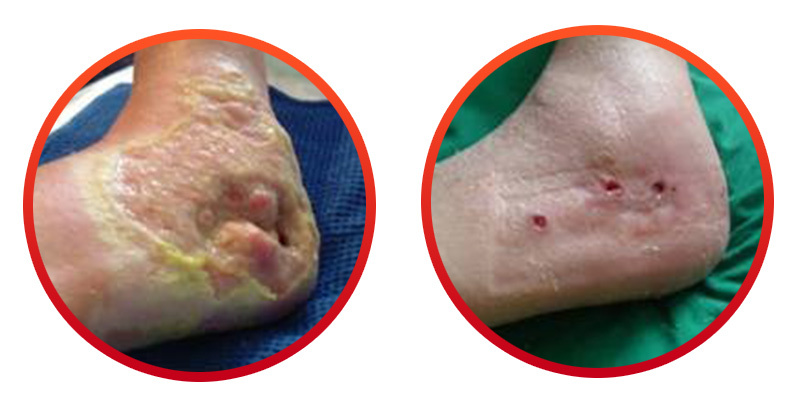 Warning for sensitive individuals – the following cases contain detailed images of wounds! Some wounds do pain less, and some, on the contrary are painful, that you simply can’t live with it. This effect on the patient's psyche is sometimes so strong that he voluntarily asks for amputation. Unfortunately, patient in this case has also been through such a condition. The wound in the ankle area was heavily infected (MRSA, pseudomona) and complicated by three fistulae leading to the calcaneus bone. Within eight months, large number of wound healing preparations were applied on this wound without any success, then Hyiodine was tried. With its liquid consistency, it allowed injection directly into deep fistulae and on the wound bed. Gradually the infections disappeared, followed by strong pain reduction. Careful work of home case nurses' along with Hyiodine, healed the wound in five months. It is generally believed that an acute wound in a young patient is healing quickly and easily. However, there are situations, where this is not that case. Young patient has caused himself serious traumatic hand injuries while playing with an explosives. In the wound, bone was exposed and there was serious nerve damage. 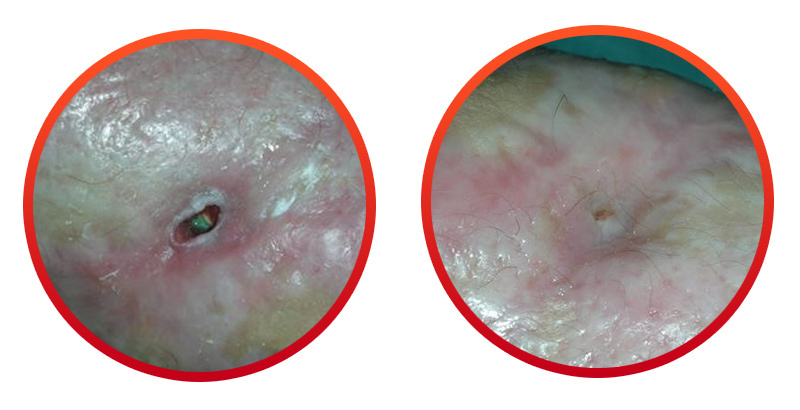 Although the wound was healing successfully, a deep fistula infected with MRSA was formed. This fistula was open for four months, without signs of healing. One and a half bottles of Hyiodine successfully healed this fistula after 8 weeks of treatment. Wounds in diabetic patients can not be underestimated. Even from a small abrasion can be developed a large ulcer within a few days. This case was similarly fast. The deep ulcer, which affected the entire heel, was full of infections and necrotic tissue. Moreover healing of the wound was complicated by 30% of the blood vessel obstructions. Attending physician worried about the risk of sepsis of the whole body has recommended amputation. By affecting the tendons, the limb momentum was disturbed, and the hope for healing was very low. Fortunately Hyiodine was indicated, and also due to carefull work of nurses, the three-month effort was rewarded significant improvement (see the second picture). Hyiodine prevented pacient’s leg amputation and also managed to restore momentum. and connect the sterile syringe. (approximately 1 ml per 10 cm2 of wound). (non woven fabric or sterile gauze). Do not use on black necrotic tissue. until it has become well saturated. 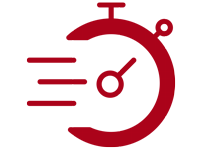 Cover with a suitable secondary dressing. for infected wounds or every 48 hours for non-infected wounds. Hyiodine is used in more than 20 countries worldwide. It helped the Czech Army during a mission in Afghanistan. 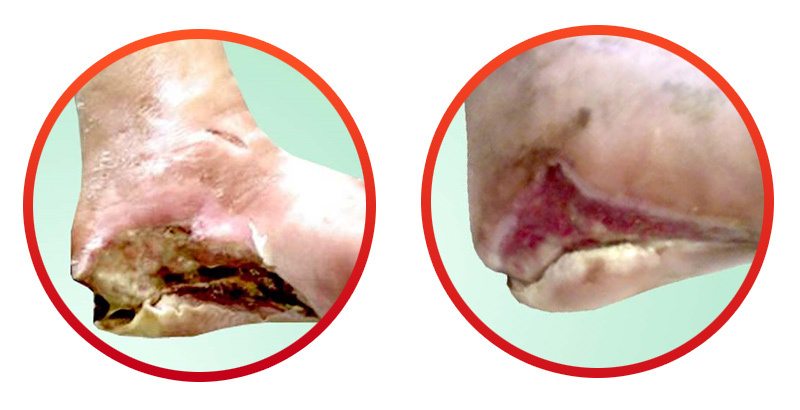 Hyiodine has been developed by Contipro in its laboratories.The design is the work not only of our own scientists, but also doctors from university hospitals and other leading Czech wound healing experts. Experience has taught me not to believe in miracles, but Hyiodine really does heal wounds surprisingly quickly and reliably. I wasn’t that happy on being hospitalised. Hyiodine shortened time I spent in hospital. I spent a year trying to heal the wound. In the end, Hyiodine did the job in six weeks!